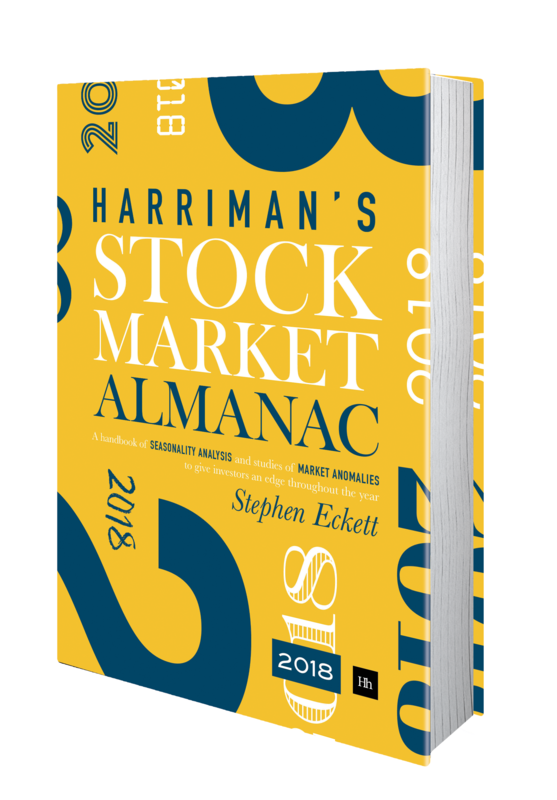 In the Almanac the performance of the FTSE 350 sectors in the four quarters of the year can be found. From this data the sectors that have been the strongest in each respective quarter can be identified. For example, house building stocks are typically strong in the first quarter of each year, so this sector could be chosen as the strong Q1 sector. This suggests a strategy which repeatedly cycles a portfolio through the four strong sectors for each quarter. In other words, the portfolio is 100% invested in the strongest 1st quarter sector from 31 December to 31 March, then switches fully into the strongest 2nd quarter sector to 31 June, etc. for the following two quarters, and the same thing again for the following years. The same four sectors are used each year. 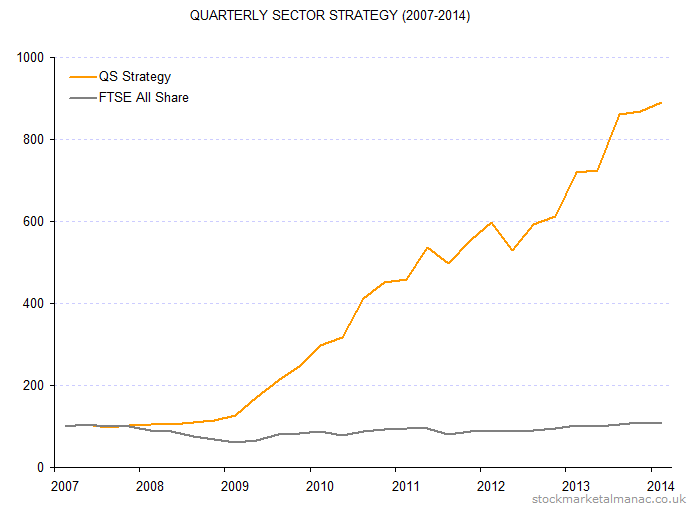 The following chart illustrates the performance of such a strategy for the period 2007 to Q1 2014, with a comparison to the FTSE All-Share Index. Both series have been re-based to start at 100. In this analysis the strategy was restricted to the same four sectors each year; a refinement would be to dynamically change the four sectors by re-analysing the latest data each quarter. Another variation would be to hold the three strongest sectors each quarter instead of just the one sector. As well as the historic strongest sector for each quarter, the historic weakest sector for each quarter can also be determined. The following chart shows the out-performance of the of strongest sector for the quarter over the weakest sector for the quarter for each quarter since 2007. This suggests a strategy combining the strong and weak quarter sectors. A variation of the first strategy would be to add a short position in the weak sectors in each quarter. For example, in Q1 the strategy would be long the strongest Q1 sector and short the weakest Q1 sector. The following chart shows the performance of such a strategy over the period 2007-2014. For comparison, the unhedged strategy from above is also shown on the chart. The hedged strategy under-performs the first, unhedged strategy, but experiences much less volatility. 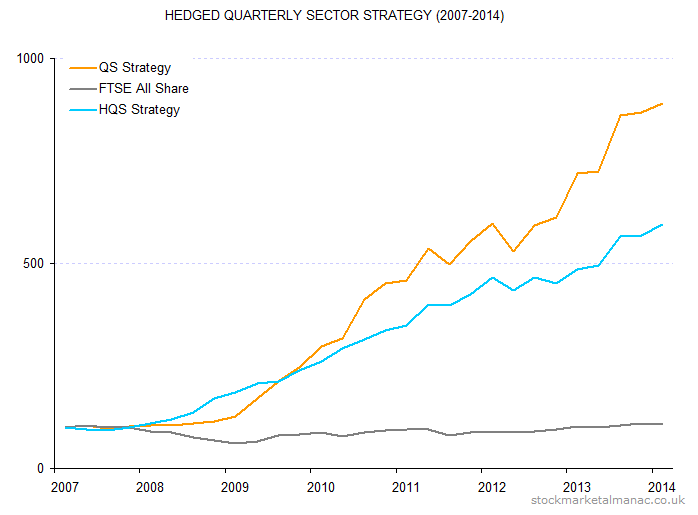 The standard deviation of the quarterly returns of the first strategy is 0.16, whereas the hedged strategy has 0.10 (for comparison the standard deviation of the quarterly returns of the FTSE All Share Index over the same period was 0.11). Note: These strategies assume that certain sectors display a quarterly seasonality behaviour; i.e. 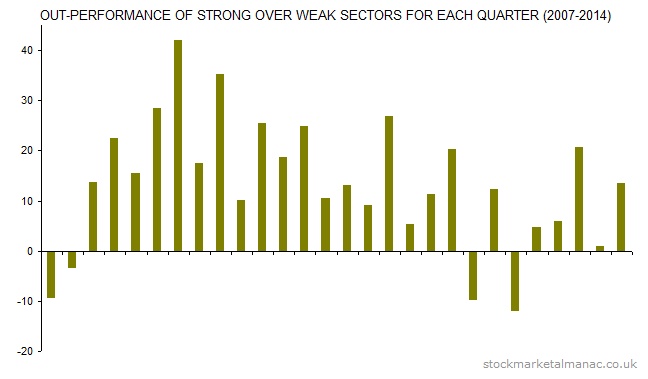 whereby certain sectors are consistently strong (or weak) in the same quarters each year.